​Do you have a plan for your home and community for fire prevention? Central Oregon is home to the nationally recognized Firewise Program and everyone should be cognizant to the vast and varied ignition sources throughout the region. Wildfire Community Preparedness Day happened last month on May 6, which is the program that is co-sponsored by the USDA Forest Service, the US Department of the Interior, and the National Association of State Foresters. This is a time when communities from all over the country work together in an effort to make their homes and communities fire free. Let’s begin with the basics of defensible space and the “home ignition zone.” The concept of the home ignition zone was developed by USDA Forest Service fire scientist Jack Cohen in the late 1990s, following some breakthrough experimental research into how homes ignite because of radiant heat. 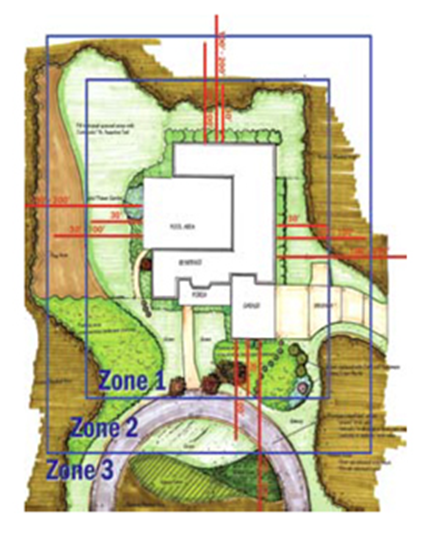 The Zone Concept was developed as a plan to help save homes and lives. There are three zones that are shown in the map below. Remove firewood stacks and propane tanks; they should not be in this zone. Consider xeriscaping if you are affected by water-use restrictions. BUT…remember to check your governing documents for instructions on how to acquire approval through the architectural review process first. Property owners need to address the "little things" first: National Fire Protection Agency (NFPA) advises property owners to start with the house and work their way out. Having a nonflammable roof covering and assembly adds an enormous safety measure. Keeping roofs and gutters clean and clear of leaves or needles is critical to minimizing ignition from embers. Flammable attachments (e.g., untreated wooden decks) are very vulnerable to ignition and can carry fire to the main structure. Keep flat surfaces clear of debris. Clean out any leaves, needles or stored material that could burn from under decks or porches. During this high fire danger season, remove large potential heat sources such as piles of firewood, spare building materials, vehicles or anything that could catch embers or ignite by flames in the grass needs to be as far away from dwellings as possible. Download NFPA’s Firewise Tips Checklist for Homeowners atwww.firewise.org that includes these and other actionable steps you can start working on today. Property Owners in Central Oregon may also contact Project Wildfire for assistance. Their competent staff will help owners assess their vacant land or homes for fire safety. Project Wildfire has also coordinated grants for Central Oregon communities to assist in the identification of fire hazard areas and the removal of ladder fuels from a community. They are a wonderful resource!